Launched in March 2015, the CrossClimate was the first of a new breed of all season tyres. Traditionally all season tyres start life as a winter tyre, and have the balance of performance moved slightly towards dry and wet running. While this leaves traditional all season tyres excellent on snow and ice, other performance qualities suffer, most notably dry braking. The CrossClimate started life as a summer tyre, and was gifted winter abilities. While this means it isn't quite as good as traditional all season tyres in extreme winter conditions, it is still more than enough for anything the UK winter has to offer, all while retaining the dry and wet performance of a dedicated summer tyre. So, with the multiple award winning CrossClimate being updated, what does the new tyre bring? Visually, the only change for the CrossClimate+ is the addition of the + on the sidewall, so we've spoken to Michelin UK to find out exactly what's new on the inside! What is the main change in the new CrossClimate+? The main change is the new latest/greatest tread compound. 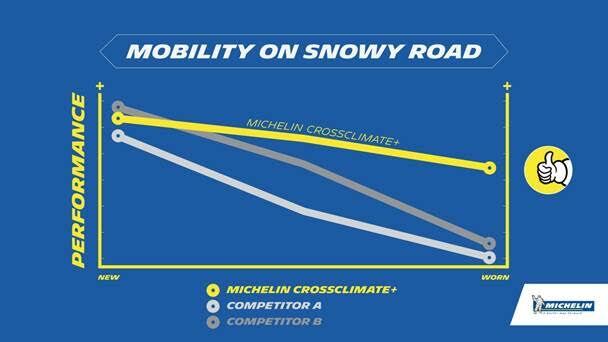 Thanks to the new compound, the CrossClimate+ delivers more mileage, so even bigger gap now to All Season competitors, and Michelin's other summer range. It's a new version of the same compound family, and this version works well in multiple geographic zones. We have significantly reduced drop off new to worn, meaning the tyre retains its dry, wet and snow performance throughout the treadlife. Are there any drawbacks to the new CrossClimate+? While dry braking performance is identical to the CrossClimate, wet braking has gone from lower part of A of the EU label, over the boundary to upper part of B, hence change looks greater than it is. It is only a slight drop in wet braking performance in certain sizes, but we've a large gain in other areas. It's still amongst the top end of the summer ranges as a 'B', only about a third of premium summer tyres offer 'A', and I think considering all the other benefits the CrossClimate+ brings, it's worth it. The new CrossClimate+ will slowly replace the CrossClimate in all but 14" sizes. The CrossClimate SUV will remain on the market, with additional 19" and 20" sizes due at the start of 2018! Still not convinced the CrossClimate is the right tyre for you? Further questions? Please feel free to ask below! Published at January 19th, 2017, 10:55 am, by Jonathan Benson.